you know when the various types are stepping it up in the bloom parade. Here in North Carolina the daffodils have had their days. The tulips have gotten enough attention now. 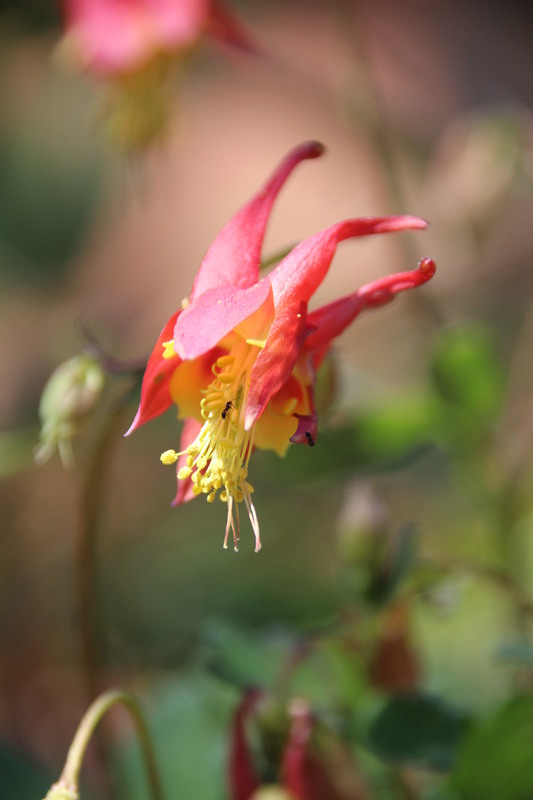 The new feature flower group is the Columbine. I have had the usual purple and pink for decades. It seems the pinks are more numerous this spring. I have two relatively new types, besides that darling tiny red ‘Little Lanterns’ from a previous post. These two have a different form of flower, both are double and the blooms seem to look up rather than nod. ‘Winky Double Red’ reminds me of a granny’s bonnet even more than the old cultivars. I love the deep mauve color surrounding the butter yellow. The buds are very dark and tight. ‘Nora Barlow’ is has spiky pink blooms with a hint of yellow. This hybrid is a bit taller than the old types. Here is one beside an old pink for comparison. I have not saved seed from these, so I don’t know if they will be true next generation. Nora Barlow does have one progeny beside the original. They are a nice addition to my collection. 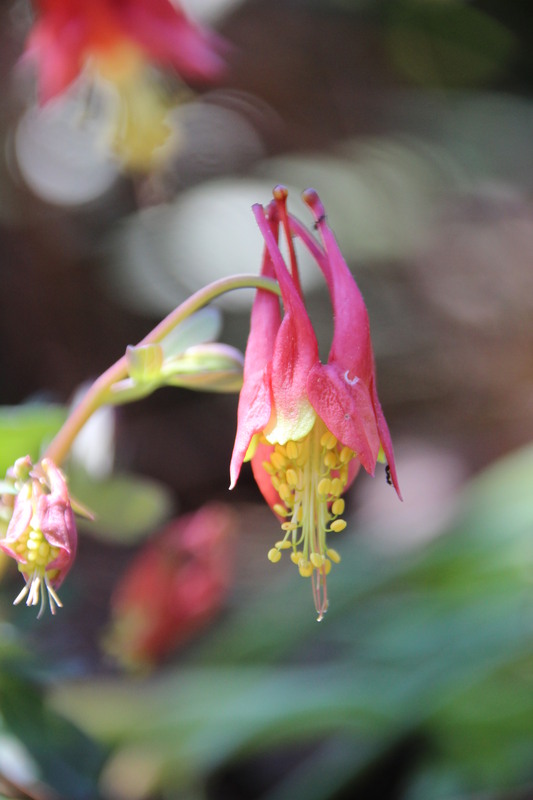 Columbines come in many sizes and colors. My largest have purple blooms. My most numerous have pink blooms. The white bloomers stand out in shade. 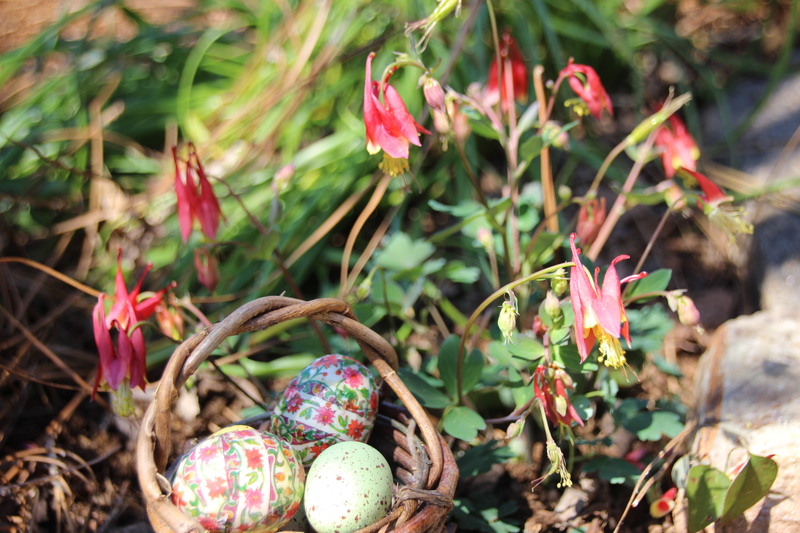 My favorite is named Little Lanterns/ Aquilegia canadensis. It usually resides in a hypertufa trough. I put it in the ground over the winter to avoid freezing. The pencil shows just how tiny it is. The blooms look like tiny glowing lanterns. I will be moving it back into a trough. I had to lie down flat on my belly to get these photos. Dirty again. I must remember to clean off the pencil before putting it back behind my ear.